1. Read the statements and fill in the blanks with the similes. 1. I bet she’s told everything to Linda. They are as thick as thieves. 2. If you are in trouble, get your friend, Mark, to advise you. He is as wise as an owl. 3. My best friend got married last weekend. You should have seen her. She was as graceful as a swan. 4. Wow, how long have you been working out? You look as fit as a fiddle. 5. No need to be afraid of Bob. He may look cruel but in fact he’s as gentle as a lamb. 2. 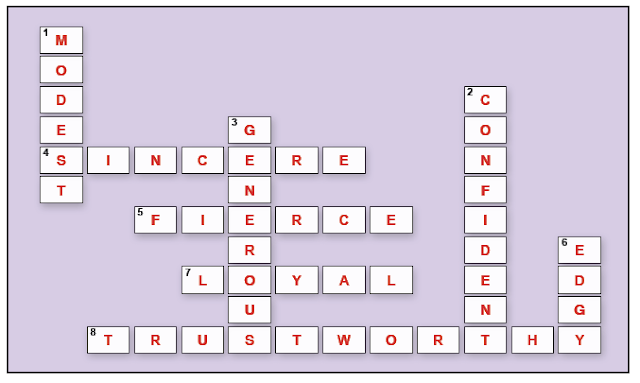 Read the teenagers describing their best friends and do the puzzle with their personality traits. 7. "Whenever I need, Amanda is always with me. She never lets me down." 3. "Zoe loves sharing everything she has with the others."